I've only been posting once a week, instead of my usual Monday/Wednesday. April 24th was one year of blogging and while I have no intentions of stopping, there's been a lot happening lately. But I think the Monday post's will be good for now because it will allow me to really focus on the one post. I can't wait to share more on here later, but good things have been happening! I bought this silk top from J.Crew and I wasn't sure how I felt about it at first. But then I wore with this skirt. And tweed skirt to work and thought about how pretty it would look with jeans for a more casual yet still put together look. I got the small, but think the xs would've been fine. However, I don't mind that it's a little loose. It's silk, so it tucks in so well, but even leaving it untucked with cropped denim would be adorable. It's subtle, but I wore a balconette bra underneath and let it show. However, definitely add a cami for work purposes because it's a bit sheer. Sidenote. This $20 skirt from H&M has served so well. I didn't expect to love it so much, but it's amazing! It's so easy to wear and I wear it with everything. I love this outfit. Every Saturday I wear a version of this to run around town in and no matter what I'm doing, it works. 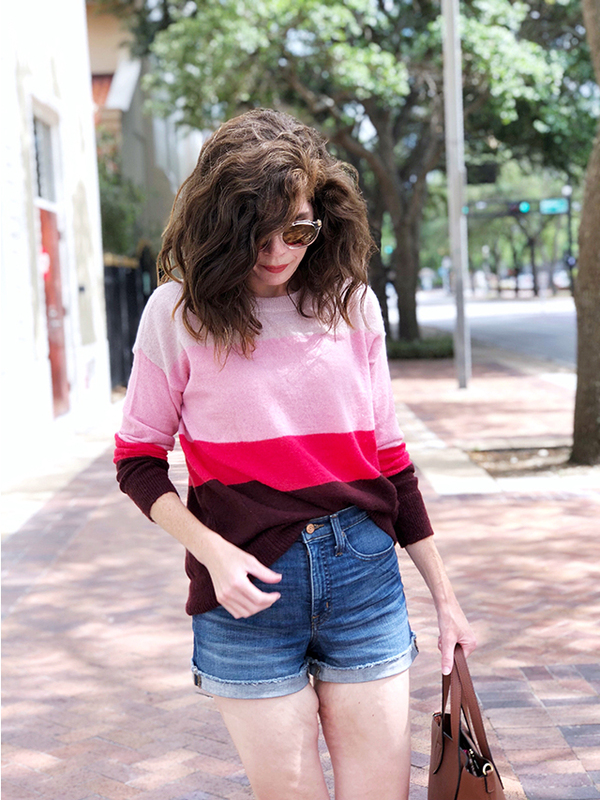 The top is actually a light sweater and I'm not sure I'll be able to wear it throughout the Florida summer, it's been perfect for right now. And how amazing is the ombre?! The shades of pink make me so happy! These shorts have been on here already, but if I'm not at work, I'm pretty much living in them. I love the high rise because I can wear my favorite cropped sweatshirts at night or loose tee's tied in a knot. Definitely a summer must have! I bought these Nike's because I didn't own a pair of actual sneakers [ besides high tops ] and while I wear them everyday for walking [ I work on a stretch of road that aligns the bay and it's beautiful to walk on, so that's how I spend my lunch break! ], I love wearing them as a casual shoe, too! Besides shoes, I'd say sunglasses are my favorite accessory. I haven't always been able to wear them #glasseskid, but once I got contacts, the first thing I did was buy my favorite Rayban's. I still wear them and love them! I have both inexpensive and expensive pairs and while it would amazing to be able to buy designer sunnies all the time... I can't. But until I can, I either like to find similar for less or other ways to buy them. I've started going to Nordstrom Rack and finding the best options! I've seen Karen Walker, Tory Burch, Sunday Somewhere, Rayban, Kate Spade. My pink Kate Spade's were a NR find! | The round Mink Pink's I wore on repeat were also from there! Also, while I mostly pop in there to browse the sunglasses and see if there's any good basics, they often have tee's from Madewell and good jeans! I've found some of the best shoes, too! I left with a huge bag of way more than I planned, like these sandals! Despite living in Florida, I never have enough sandals, so I picked these up, they're 1.State, a brand I love and they're so comfy. 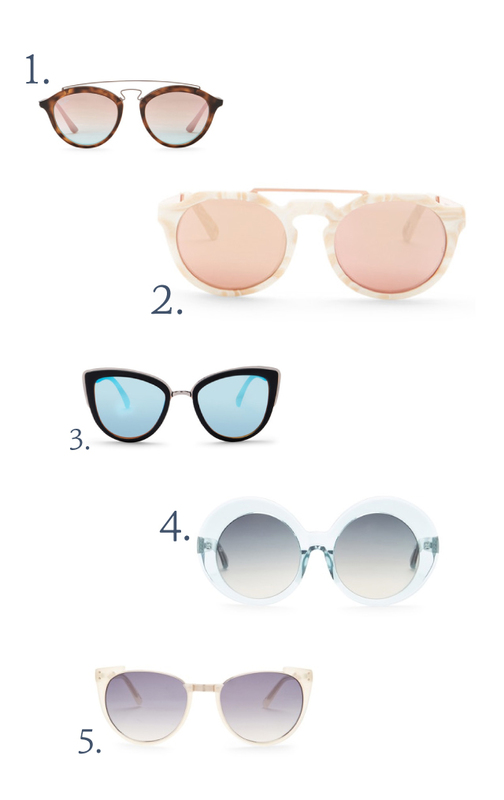 I couldn't link my exact sunnies, but I compiled 5 favorite pairs that I'm loving right now! The Quay's [ #3 ] have actually been on my wishlist, so I might go ahead and get those and Linda Farrow is one of my fave designer's for sunglasses! How cute are they?! I've been trying a lot of new products lately and some have been amazing purchases and some have not. For the most part, the products themselves are great and highly recommended, but I have highly sensitive skin, like I mentioned here in my first skincare post, and a lot of products won't work for me. If they have a scent or if they're too strong, chances are my skin's going to react. I've also been paying more attention to ingredients. There's so many bad / cancer causing ingredients in skincare and makeup and those things can impact your skin. I'm not sharing these to complain, because honestly I wanted to love them. But if someone else with skin who hates nearly everything, reads this and finds it helpful, then good, because it has taken me forever to find a routine I'm comfortable and it's still a work in progress. I'm going to share the products I've been loving soon! I wanted to love this because it smells really amazing, but I don't think it was strong enough for my hair. I have super thick, curly hair and I only wash it twice a week, so I need a dry shampoo that will actually revive it and make it smell good. This one felt like I was just misting my hair. However, I just started using the clarifying shampoo and I really like it! I bought a Drunk Elephant sample kit at Sephora during Christmas and the packaging is amazing. However I was breaking out when I wanted to try this and my breakouts continued to get worse as I used this. I would have repurchased this had I been able to use it because it's so light and soft on the skin. It essentially was like putting whipped cream on your skin and a little went a long way. I had never tried an oil before, I thought I might like this as I have dry skin, but I think trying the serum, moisturizer and oil all at once was way too much at once and while they came as a set, they felt gentle putting on my skin, but it was a lot for my skin. I have to have a toner. I could use the most effective products and without a toner, they would be useless. I tried this Darphin Toner and it was really nice because it didn't smell like alcohol and it made my skin feel hydrated and soft. However, I broke out even worse, I think it was from the scent. I would recommend this product, though because it wasn't drying and it leaves your skin feeling super soft! This was the biggest disappointment. I wanted this to work and for my skin to accept this, but the subtle floral scent is what made it a fail. There's such a pattern here. I essentially can't use anything on my skin. But this moisturizer was cooling and hydrating [ something I always look for! ] and I know a lot of people recommend Tula! I genuinely do not like this product. The wand is huge. It makes a mess. Product was everywhere and it didn't compare to Benefit Gimme Brow. If I switch to a drug store product, it has to at least be comparable to the premier brand for me to keep using it and I couldn't keep using this. I switched to Soap and Glory's and I love it! 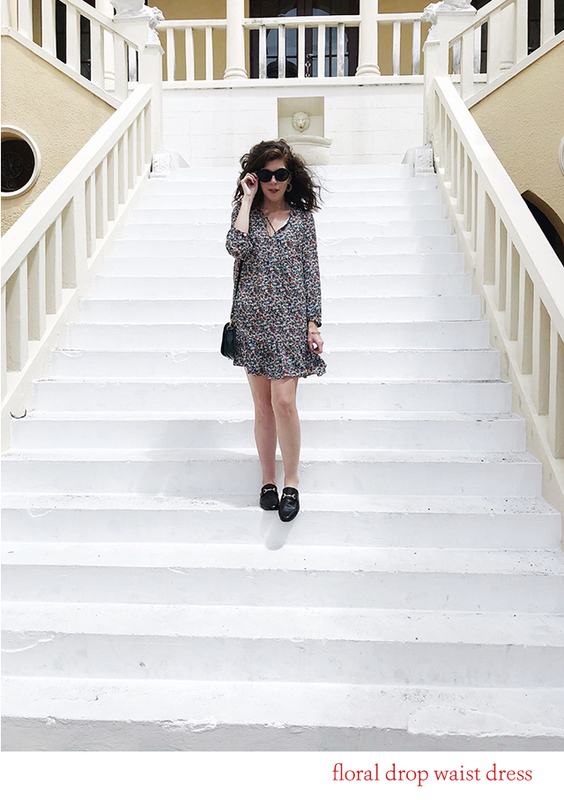 This floral dress was one of my J.Crew Factory purchases. I've always liked drop waist dresses, the ruffle at the bottom is so fun and this particular dress is good for work, but super cute and relaxed for a weekend outing, too! Looking in my closet, almost all the print is stripes, but I really like this floral, the bright jewel tones pop against the black and I loved pairing it with black and dark green! Pairing black and another dark color, like navy or dark green, is a really great way to add slight juxtaposition. They go together, but there's a slight variation and it's softer than all black everything. For the dress, I went with my usual size, xs, and there was plenty of room. The length was also perfect! Sometimes I'll size up to add length and it wasn't needed with this dress. Normally, if I decide to wear earrings I would only wear studs. I have a lot of hair and you either couldn't really see the earrings anyway or they would get caught in my hair... Half the time, I would keep my favorite pearls or tiny emerald studs in all the time and only switch them out when I wanted a change. Lately, I've been loving hoop earrings. I've kinda started a small collection and I've been rotating them out with different outfits. While I'm partial to all the different sizes of hoops, the medium sized, chunky hoops have to be my favorite. Possibly because you can still see them even when my hair's down, but I also love throwing it up into a high pony tail and just having the earrings be my only accessory. They're the perfect statement piece anyway. 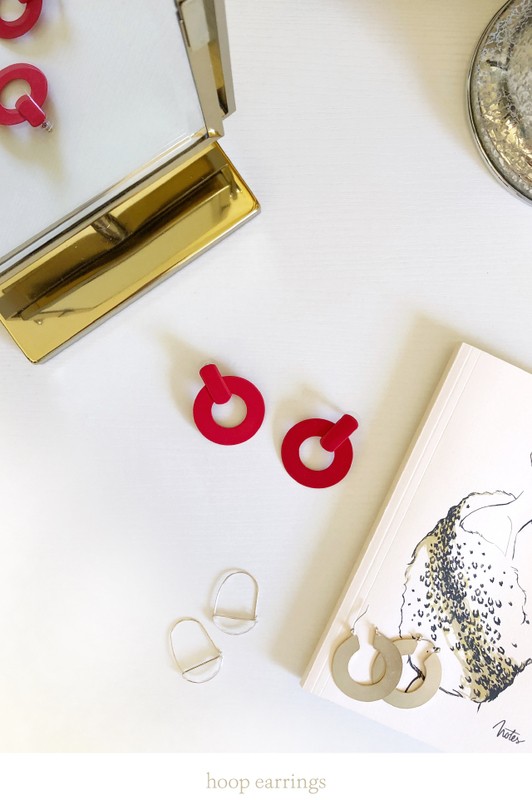 red flat drop hoop earrings | I love this pop of red! These are so fun and they're light weight, which is a necessity for me. I don't like anything too heavy or interfering. crescent hoop earrings | I found these at Anthropologie and they are so pretty! They're really delicate and pretty! gold flat hoop earrings | I probably wear these the most because they work with nearly every outfit and the gold is a really light shade and brushed texture. What trend are you loving? Hi! 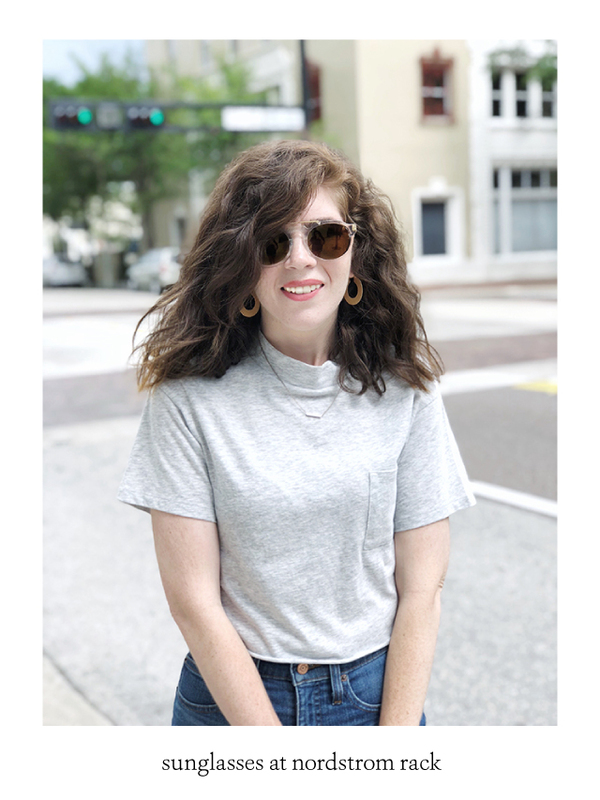 I'm Meghan, I'm 27 & I'm a graphic designer living in Tampa. Regardless of what I have planned for the day, my favorite part has always been deciding what to wear!